I really wanted to read this ARC. It sounds so interesting. Thank you for the giveaway. Petra - There are no zombies. The rotting corpses are just lying in the street waiting to be taken away and thrown in a swamp full of crocs. Let me just say that this cover is amazing! Thanks a lot for the chance to win an ARC! I love this cover. This book sounds very interesting. Thanks for the giveaway! Thanks for the chance to win an ARC! I'm intrigued by the Poe connection to this story, as I'm quite a fan of Poe. Interesting stuff! The title is so beautiful! Great story and thank you for the giveaway. The story sounds amazing! And the cover is gorgeous! And I love books that make you feel everything along with the characters :) Glad to hear you liked it so much! This sounds like a great story (although it might've missed the mark in execution) but I'd like to give it a shot. This sounds like such an amazing book, and as a reader who just devours literature about the plague, I need to read this soon! Thanks for the great giveaway, Lenore! The worldbuilding in this sounds incredible, I am SO fascinated! It's a shame that while it had an affect on you whilst reading, that feeling didn't stay long after. But it still sounds like such an intriguing story! I cannot wait to read it. Thanks so much for the giveaway! 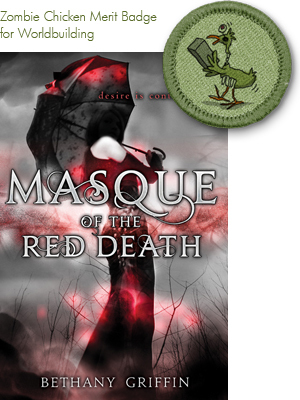 In Masque of the Red Death, which is very loosely based on Edgar Allen Poe's short story of the same name, the author creates a unique and vivid dystopian world. In an unnamed city at an undetermined time (it could be the past or the future; what technology there is seems rather steampunk, but some of the science seems fairly advanced), a devastating plague has killed much of the population. There's still danger of infection, and Prince Prospero rules the city despotically from his castle in the surrounding countryside. The rich have access to masks that keep them from contracting the disease, but the poor can't afford the masks and they have to take their chances every time they go outside. Araby Worth is the daughter of the man who invented the masks. As her scientist father is in the service of the prince, they live in a luxury apartment in the upper part of the city. Araby lives with terrible guilt because her brother died of the plague years earlier. She and her friend April, the prince's niece, spend their nights at the creepy Debauchery Club looking for oblivion.